This weedy perennial has been reported from Boone, Grant, Lagrange, Lake, and Marion Counties. 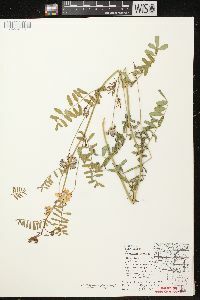 A clump of this species was found in a waste place in Bluffton, Wells County, and, its weedy nature being unknown, was planted in our field for observation. We soon learned by its rapid spread from underground stems that it would be a pest but kept it until it flowered in order to ascertain its identity. We then destroyed it but neglected to preserve a specimen. 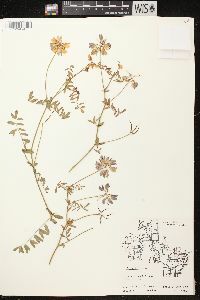 The Lagrange County specimen was collected by Nieuwland and is in the herbarium of the University of Notre Dame. Loosely ascending perennial 3-10 dm; lvs sessile, 6-15 cm; lfls 11-25, oblong to obovate, 1-2 cm; umbels 10-20-fld; fls 10-15 mm, pinkish; fr linear, 2-6 cm, 4- angled, with 3-7 joints; 2n=24. Native of the Mediterranean region, widely planted along highways in our range, and frequently established elsewhere. May-Sept.